Welcome to the Artistic Outpost Spring New Release and Blog Hop! 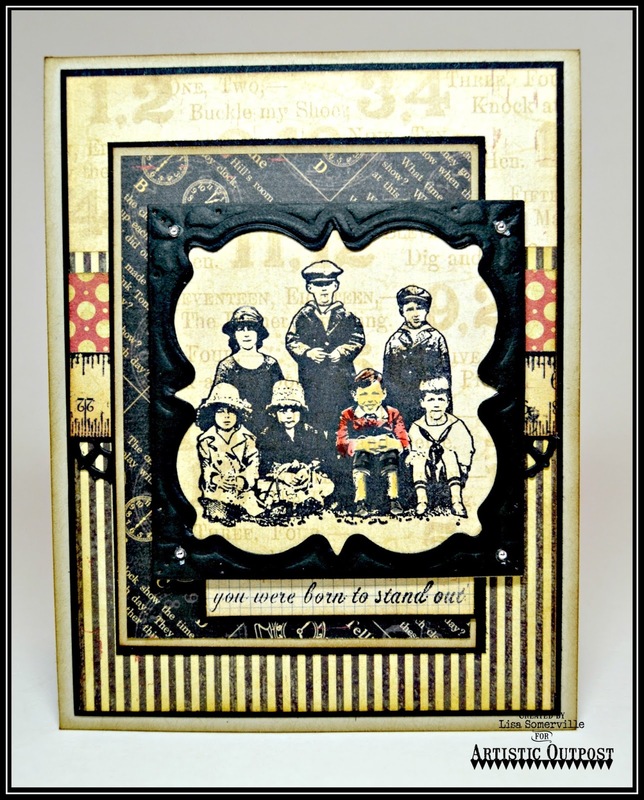 This month, Artistic Outpost is releasing two stamp sets, click here to see the new releases! Keep reading below to see how you can win a $15 Artistic Outpost Gift Certificate! I just love the sweet children in the Springtime stamp set! I've made quite a few cards using the images, and thought with it being graduation time for a lot of people, I'd share this one. I think it would make a wonderful graduation card! The image is stamped in Black Archival on a scrap of pattern paper, then colored using STAEDTLER Watercolor Pencils, blending the color with Gamsol. I framed the image using one of the dies from Our Daily Bread Designs Layered Lacey Squares die set, adding a border from this same die set as an additional card element. The sentiment is from the Think and Wonder stamp set. 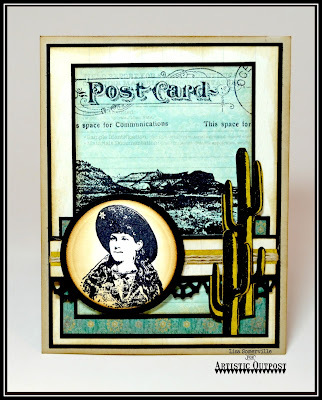 My next card uses the Artistic Outpost Wander and Dream and Ephemera Backgrounds stamp sets. Just for commenting on the Design Team Blog Posts, you have a chance to win a $15 Artistic Outpost Gift Certificate, good towards the purchase of AO Stamps. You have until May 23, 2015 at 10:00 PM CDT to leave a comments on the participating designers blogs for a chance to win! Three random winners will be selected from the comments left on the designers blogs, the winners will be announced on the AO Blog on May 24, 2015, be sure to check back there to see if you have won! Wonderful cards created with those great new stamps from AO, the graduation card is fabulous! You rocked the release GF! Great card, I think I see your Grandpa standing in that group, love the vintage goodness you got out there. The postcard background is amazing in the SW set, you did good GF! 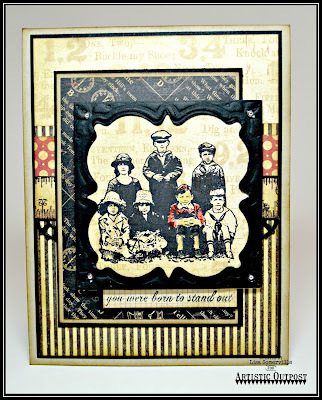 Lisa, I am new to Artistic Outpost, but am just enamoured with the stamp sets I have found there. These cards are just wonderful. I love the technique you used for the group of children. Love those adorable Springtime kids in frame, which is quite lovely itself! All the paper layers are so beautifully cooridinated. And the Western Gal on the Post Card is gorgeous! Great fussy cutting with the catcus! Love them both, Lisa! Oh WOW! Completely AWESOME cards, Lisa!! Oh, I love how you've colored in that one little Springtime boy to make him stand out! That would make a great graduation card! Lisa, your cards are beautiful! love the neutral/vintage tones. beautiful as always Lisa love the layers on the Spring Time card. Both of these cards are wonderful Lisa but the image of those children on the first one has won the top prize for me. Beautiful. These are now on my wish list. I'm a big fan of your cards and these samples are GREAT! I love the new release stamps!